Do this, don’t do that, can’t you stop the swarm? Last Spring in New Jersey was a roller coaster of weather, which you know is never a good thing for a beekeeper. In February, we had temperatures in the 70s, it felt like Winter was over and sunny days were here to stay. It seemed like Spring was coming two to three months early and I was already dreaming of having honey supers on before St. Patty’s day. But Mother Nature had other plans and in March, we had a blizzard, with some areas getting well over a foot of snow. The snow melted, but the colder than usual temperatures stayed around through April, which was then followed by an unseasonable amount of rain. I imagined that my hives were like drag racers at the starting line, revving their engines, ready to get to work and start bringing in the nectar to make lots of honey. But instead, the bees were stuck inside the hives, cramped, until the weather finally cooperated. Just after tax day, I knew Spring was finally here. I didn’t have to look outside to see the sun shining, or hear the birds singing. I knew Spring was finally here because our club’s Facebook page was filled with posts about swarms. Here a swarm, there a swarm, everywhere a swarming swarm. It had been about six years since I’d seen this many swarms in our area. Back in 2011, we had a similar start to our season, with weeks filled with rainy days. When you visited your hives during the few non-rainy hours you would just see how grumpy bees get when they’re stuck inside for too long. It’s like having a bunch of six-year olds hopped-up on sugar, standing at the door trying to make the rain go away. 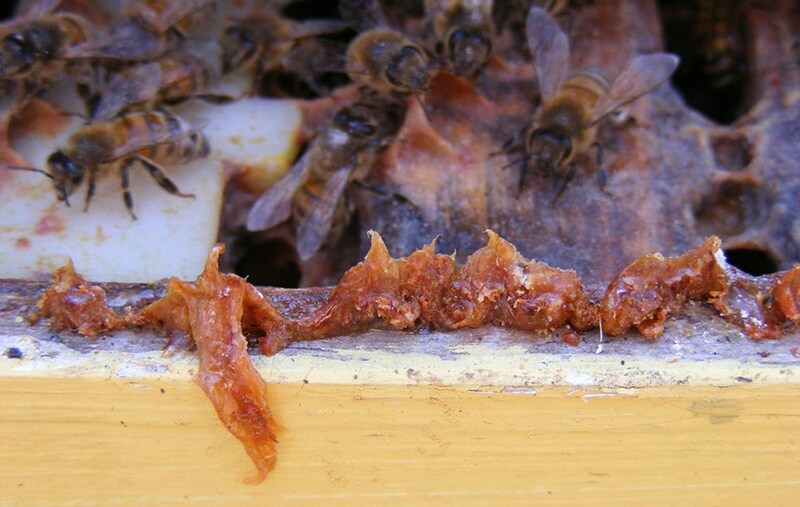 Swarming is caused when the bees feel they are too crowded inside the hive, and prolonged rain keeps more bees inside their hive, which only exacerbates the problem. 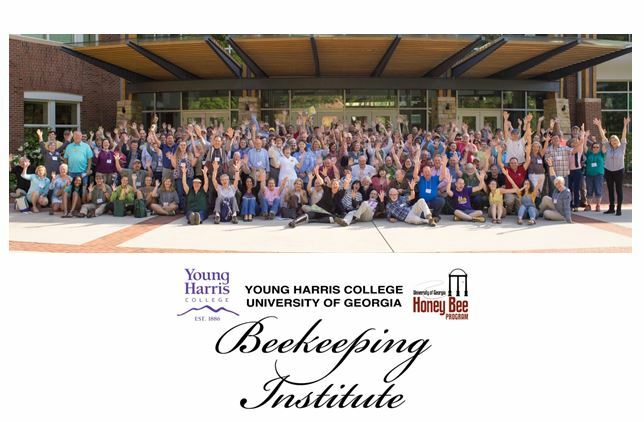 Also, for new beekeepers, it is also important to remember that bees do not count foundation as more space, only drawn comb counts as space. So, if you are just starting out, it’s important to go into your hives to see where your bees are, feed to encourage comb building – especially when it’s raining, and add your next box before it is too late. For established hives it’s always important to remember that when bees are at the top of the hive, with only the inner cover above them, they feel like they have run out of room and this, too, can cause swarming. The best way to prevent the bees from feeling they have run out of room is to reverse your boxes in March to prevent swarming in May. However, remember that you should always check where the brood nest is before reversing your boxes. If your brood nest is completely in the top box, go ahead and reverse your boxes. But, if you have brood in both boxes, you should keep the brood nest intact, as the bees may not be able to keep two separate brood areas warm if the temperature drops. I also think that putting honey supers with drawn comb on early can prevent swarming, as you have given the bees lots of extra space. One point of debate when you put honey supers on is whether or not to use a queen excluder. If you’re using your supers to also prevent swarms, then the answer is, NO. Using a queen excluder can also create the “this is too crowded” feeling because you are limiting where the queen can go. But, if you don’t use the excluder, you will have to deal with brood in your honey supers. Personally, I’d rather deal with the brood than my hives swarming. Especially when the queen lays early in the season as I have found that as soon as the brood hatches out, the bees will go back and fill those cells with nectar, so I end up with honey supers filled 100% with honey and 0% brood. I’ve been keeping bees for about 10 years. 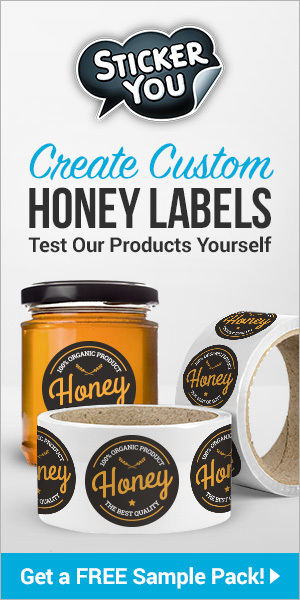 During my first couple of years, I was so focused on limiting the mistakes I made to my own hives that I never went after any swarms. Starting in 2011, I added my name to the New Jersey Swarm page, as I felt I was ready to make mistakes beyond my own hives. 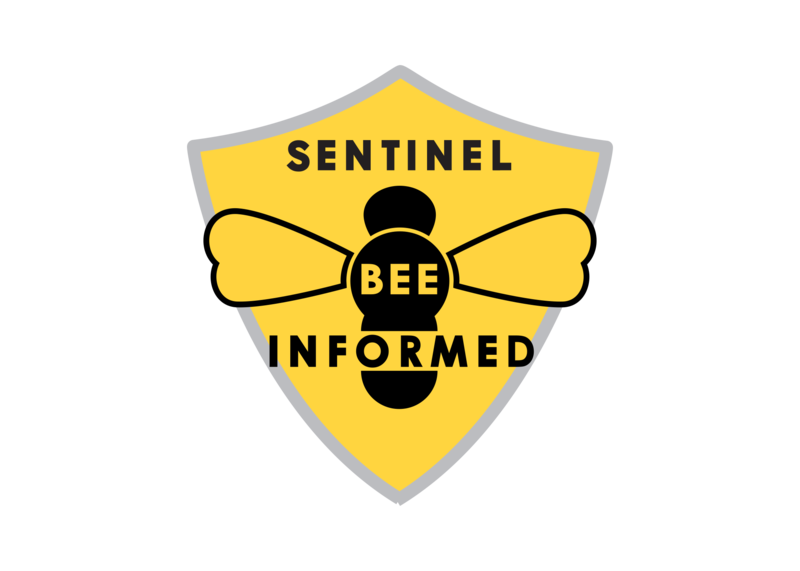 The New Jersey Swarm page is set up so that if someone sees a swarm, they can search for a beekeeper by town or county, who will come and remove it. The good news about living in such a populated area is that if a hive swarms, someone is going to see it. Having thousands of beekeepers throughout one of the most densely populated states means you tend to get a lot of swarm calls. The bad news is that someone is going to see it, before you do. When I first decided to start catching swarms back in 2011, I wasn’t really prepared to catch them, so when I got a call, I had to scramble to get everything I needed to go catch one. Usually, I also forgot something or wished I had packed one more item to make my swarm catching go more smoothly. In the Winter of 2012, while thinking of what bee stuff I could do, I decided to create the ultimate swarm box. I used a nice-sized cardboard box, and I cut out ventilation windows on all four sides, then covered the “windows” with screen, so the bees had plenty of air, and I wouldn’t have to worry about them overheating or getting out. I also reinforced the box with tape to keep it sturdy because I planned on using it to catch a lot of swarms. I then filled the box with everything I might need: garden sheers to cut branches; Gorilla tape to seal the box once the bees where inside; a bottle of sugar syrup to spray the swarm; an old bed sheet to wrap around a tree; some old comb to make the bees feel at home; and even a stack of New Jersey Beekeepers Association educational flyers about swarms to give to anyone who wanted to understand what was happening. It was a busy, creative Winter. 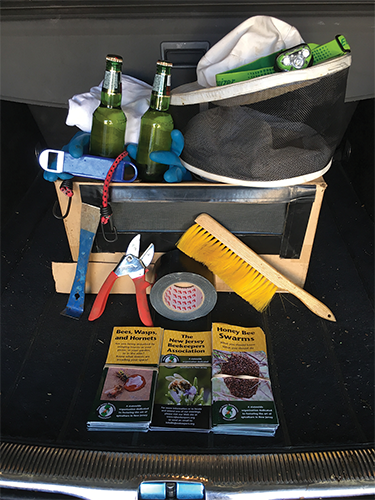 Once I had my ultimate swarm box, complete with all the swarm supplies you’d ever need, I put it in the trunk of my car, so I would be ready for that next call. And man was I ready! When I started hearing about swarms in other parts of the U.S., I’d get even more excited, thinking that soon it would be my turn. But days turned to weeks, weeks turned into months without receiving even one call. So, I put my ultimate swarm box, complete with all the swarm supplies you’d ever need, away for the season. 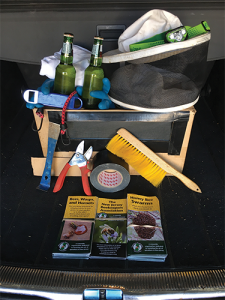 The following Spring, I pulled out the ultimate swarm box, complete with all the swarm supplies you’d ever need, and put it back in the trunk of my car, and waited. And, I waited. I waited for three more seasons, and still, I was never able to use my ultimate swarm box, complete with all the swarm supplies you’d ever need. Four years in a row, I had put everything in my car so I’d be ready for that swarm call and nothing, not even one swarm call. Yes, there had been swarms in my area, but other people always seemed to get the call, not me. Several beekeeping friends would call to tell me all about catching the ‘biggest swarm you’ve ever seen”. I would listen to their stories, imagining it was me who was catching the swarm, and thinking how I’d use all the swarm supplies I’d ever need to make the job go as smoothly as possible. There were a few times when I debated, (with myself,) about skipping family vacations, just so I could be ready for when that swarm call finally came in. If there were a sunny day after a few rainy days, I’d tell my boss, I needed to “work from home,” just so I’d be ready. As this year began, I saw my ultimate swarm box, complete with all the swarm supplies you’d ever need, sitting in my garage mocking me. As it was sitting there, all cozy on its shelf, I could tell it was thinking, “When does my Summer long ride around in your car begin?” So right then and there I decided, not this year swarm box! This year you’re going to stay right where you are. This year, I’m not wasting a bunch of my trunk space just so you can go joyriding around, enjoying the Summer sun. This year is going to be different! Boy was it different. 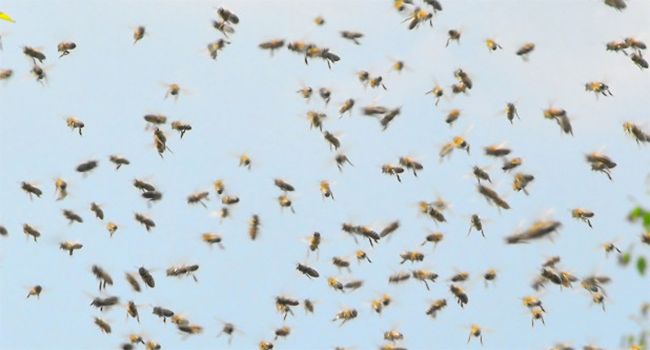 Starting in early April, I began hearing about swarms in New Jersey. But I wasn’t going to budge, swarm box stayed in the garage. But finally on Mother’s Day, I got the call! It’s was five years after its creation, but I was finally going to use my ultimate swarm box, complete with all the swarm supplies you’d ever need! I arrived at the home where the swarm was taking up temporary residence. I handed the homeowners several copies of the pamphlets I’d been hauling around for five years. I positioned the ultimate swarm box underneath the swarm. And man oh man, it was a beautiful swarm. It was teardrop shaped, which I’m convinced represented tears of joy because the bees were that happy they would get to bee inside the ultimate swarm box. I used the garden sheers to cut the few branches the swarm was attached to. Then, like they were on the backs of angels, my swarm glided smoothly into the box. I closed it up, used the Gorilla tape to keep it shut, and I was waving good-bye to the homeowners less than 15 minutes after arriving. If I just caught the swarm and left, it would have been taken me less than five minutes, but I spent several minutes explaining to the family what a swarm was, why bees do it, and how gentle the bees are when they swarm. Then after I caught the swarm, I also spent nearly 10 minutes just admiring the bees in my ultimate swarm box. I felt like a proud papa admiring his newborn child. I drove back to my hives with my ultimate swarm box finally fulfilling its destiny by transporting a newly caught swarm. During the drive, instead of buzzing, I could have sworn I heard them humming because they were so happy to be enjoying the pure luxuries of the ultimate swarm box. Once I arrived at my apiary, I set up a nuc box and finally poured the bees into their waiting new home. As the swarm slid out of the box, many of the bees looked over at me and gave me tiny bee thumbs-ups to let me know how wonderful it was to experience the ultimate swarm box. If I live to be 115, I’m not sure if catching a swarm will ever again go that perfect for me. I’m back to keeping the ultimate swarm box, complete with all the swarm supplies you’d ever need, in my car. So one thing I know for sure is: With that swarm box back in my car, there is no way I’ll be getting another swarm for the next five years. 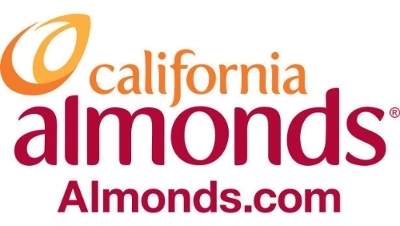 CATCH THE BUZZ – Almonds, almond orchards, and almond coproducts. Zero waste is the goal…nothing left to take to a land fill.